Tinicum Township, in Bucks County, is located entirely within the Eastern portion of the Pennsylvania Highlands. Abutting the Delaware River, Tinicum is an active and engaged community. The Tinicum Civic Association automatically includes all residents, giving everyone a chance to get involved. The Association puts on the annual Arts Festival, which last year was supported by over 200 volunteers and raised over $100,000 dollars for local non-profits. This is also a conservation-minded township—the Township government voted in 2002 to support a bond to buy conservation easements throughout Tinicum. Today, over 40 percent of Township land is under conservation easement or otherwise protected, much of it along the high-priority Delaware River or its tributaries. This conservation ethic is one of the many factors that attracted Dr. Marion Kyde to Tinicum. 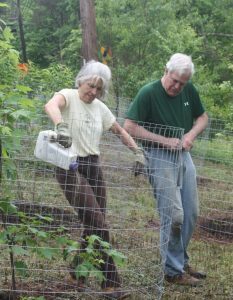 A 35-year resident of the Township, Dr. Kyde served on the board of the Tinicum Conservancy for 15 years and still volunteers on their behalf, and also sits on the Township’s Land Preservation Committee. In early 2018, Dr. Kyde began pursuing an exceptional riparian forest buffer project in her capacity as Chair of the Committee. The proposed site was land owned by Richard and Stana Lennox, in the heart of Tinicum Township. While the Lennox’s property is already under conservation easement, Dr. Kyde envisioned a way the land could be improved. Sitting on the banks of a Delaware River tributary, the land was formerly a dammed swimming hole. When the dam was removed a few years back, the land was reclaimed by mug wort and goldenrod. Dr. Kyde expects the creek to eventually cut through this natural wetland—when it does, it will need a strong riparian forest buffer to protect the steep slope of the land and the quality of the water. “Everything we can do to enhance the beauty and environmental security of the property that we are fortunate enough to be caretakers of, we should do, with the help of the Tinicum community,” says property owner Stana Lennox. This sentiment encouraged Dr. Kyde to move forward on the project to help improve the land, the quality of the nearby river, and help support the environmental passion that runs strongly throughout Tinicum Township. 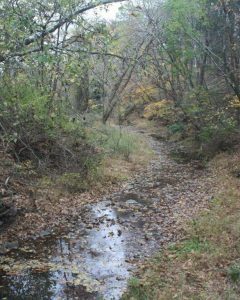 To achieve this end, Dr. Kyde applied to the newly-revitalized Lower Delaware Wild and Scenic River mini-grant program. Her proposal for a riparian buffer planting on the Lennox’s property received top prioritization by the grant committee and was given a grant of 2,000 dollars to complete the project. Coordinating with local business A&S Performance to perform the labor, Dr. Kyde added over 2,000 dollars of value to the project through volunteer contributions. The planting took place in May 2018. 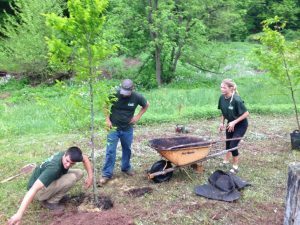 Along with A&S Performance, the Lennoxes and volunteers from the Tinicum Conservancy planted 15 trees on the sloped land near the road, which will eventually become riverbank, in just one morning. 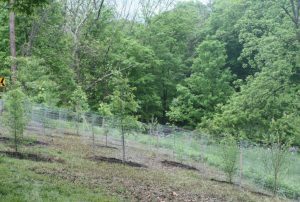 The trees now stand small but sturdy, protected from deer and other wildlife by rings of fencing that will be removed once the trees grow taller. “We had a ball,” says Dr. Kyde. 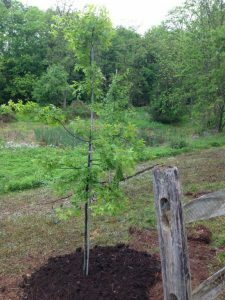 “We laughed, we joked, we ate donuts and drank lemonade, but all the work got done.” The trees planted by the volunteers, a mix of River Birch, Swamp White Oak, Ironwood, American Plum, Red Maple, American Hornbeam, Sourgum, and Pin Oak, are all facultative wetland plants. These were chosen not only for their wildlife value, but also for their aesthetic beauty. “I’m hoping this will provide a much nicer road view,” Dr. Kyde explains. “This is a dangerous corner. I’m hoping that…it will slow people down.” The trees will also provide shade for the stream and provide a habitat connector to downstream forest areas, filling a critical gap in protection. The Tinicum riparian project was high in the mini-grant application ranking because it managed to hit five of the six goals outlined in the Lower Delaware Wild and Scenic River Management Plan. The project exemplifies the ways in which small projects are critical to achieving larger management goals, a practice undertaken by all our partners across the Pennsylvania Highlands Coalition. Small projects like the Tinicum riparian buffer are critical as a complement to more large-scale preservation efforts that can be achieved through Highlands Conservation Act funding. “I want my gravestone…to say: ‘The Woman Who Planted Trees,’” jokes Dr. Kyde. However, the moniker is an accurate one. Dr. Kyde, in her various capacities throughout Tinicum Township and the Pennsylvania Highlands, has brought in over 400,000 dollars in grants to the Township and has completed three other riparian buffer projects in the region. The Pennsylvania Highlands region has always been a network of engaged and passionate partners, working in beautiful landscapes to protect critical resources. These organizations continue to undertake projects that support the health of the entire PA Highlands. The PA Highlands Coalition is proud to stand in support of these partners and their innovations. The Pennsylvania Highlands is home to critical treasures and extraordinary organizations. Highlight the Highlands is a blog series that features outstanding places and projects in the PA Highlands. Find past and future installments on pahighlands.org/category/news. To learn more about riparian buffers, watch the PA Highlands Coalition’s webinar on multi-functional riparian buffers here. The Pennsylvania Highlands is part of the four-state Highlands region, a nationally recognized high-value natural resource conservation landscape stretching from Pennsylvania to Connecticut. Funding for conservation projects in the Highlands is provided by the federal Highlands Conservation Act. For more information on federal funding, click here.